This spot certainly belongs to India’s Manasi Moghe. She was nowhere in any list when the pageant started, but she kept giving her best. She surprised everyone during the prelims. She looked beautiful like a rose in the evening gown. Her smile made her a standout. She was easily one of the most beautiful girls in the show and instantly made it to every list. Some fans even considered her for the top spot. She proved all right by placing on merit in the semi-finals and then advancing up to the top 10. We feel she deserved a higher score in the evening gown round. Nevertheless, she did wonderful for herself and her country. To us, it was no surprise to see Miss Poland miss the cut. She is beautiful, but she could have done a lot better in prelims. The real surprise to us was exclusion of Miss Israel Yityish (Titi) Aynaw. She was a standout since the beginning of competition. Even during the prelims, she was clearly among the best girls. She excelled in both swimsuit and evening gown rounds. We feel she might have either missed the cut by whiskers, or she was intentionally kept out because if she had made it to the semi-finals, it would have been difficult to keep her out of the top 5. May it be the preliminaries or the finals, the moment she stepped on the stage in the swimsuit, you feel she is perfect. There is absolutely no flaw whatsoever in the body of Jakelyne as per the conventional standards. She is perfect and deserved a score of 9.99. In fact it is surprising why she was not the top scorer in the swimsuit round of finale. Her face is magnetic and when she walks on the stage, one hardly notices anything else. In the white gown, she looked like a Goddess in motion. It would have been wonderful to see her in the top 5. If she had won, she would have been mentioned along with likes of Dayana Mendoza and Oxana Federova for her divine beauty. The costume is large and the beautiful peacock feathers have their own effect. We can imagine how magnificent it can look in person. Add to this, Nastassja is a beautiful woman and carried the dress with amazing skill. 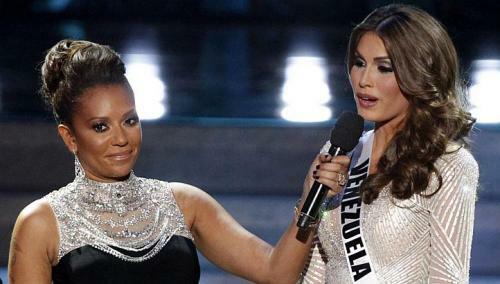 Miss Venezuela’s answer and this is no surprise because she won the crown due to it. The question came from Judge Steven Tyler, “What is your biggest fear and how do you plan to overcome it?” Venezuela replied, “I believe that one may have a lot of fears but nonetheless this is nothing negative. I believe we should overcome all of our fears and this in turn would make us much stronger. And thus, we can become much stronger persons. As soon as we overcome our fears and we’re sure of ourselves, we can face any challenge. Thank you.” The question was negative and such questions are dangers because if you answer them honestly, you lose the crown. This question was asked to Miss Switzerland in 2006. She gave a logically correct answer, but there was nothing special. Gabriella intelligently used the challenge as an opportunity. Instead of giving the precise answer, she gave a round-about but “good to hear” answer. Her confidence and charming delivery helped her win. We had rather choose the girl in this category as the eventual winner at the pageant. For us, she is Miss Spain Patricia Rodriguez. She is genuinely beautiful girl. She is natural. Even if you look at her in swimsuit, it seems she never needed a gym. She has the perfect natural body which mostly comes either to those blessed souls who receive it in their genes, or those who learn swimming since a young age. In the evening gown round too, she looked simple and yet angelic. We feel such natural beauties could be encouraged. Had this been Miss World pageant, perhaps Patricia might have been chosen as the winner. FYI: Patricia Rodriguez was a participant of Miss World a few years ago and ended only as a semi-finalist. Yes I totally agreed wid u.Yes Manasi is surprise of the year.But it was also quite surprising when she was out of contest.Actually She is talented and beautiful enough that she might be the Miss universe. Actually she was most deserving candidate for Miss universe. Better luck Manasi for next oppurtunity. I do agree with you in most of the categories but I think Russia deserved the award for National Costume. Speaking of Miss World re Patricia, she competed in Miss World 2008 and made top 15. Just as former first runners up Ada and Yendi who competed in MW 2007. Russia’s NC was also very good..Infact she was 2nd in our voting list…However, Nicaragua won it with one extra vote… !!! Venezuela had a good response but did she actually answer the question…actually none of them did.